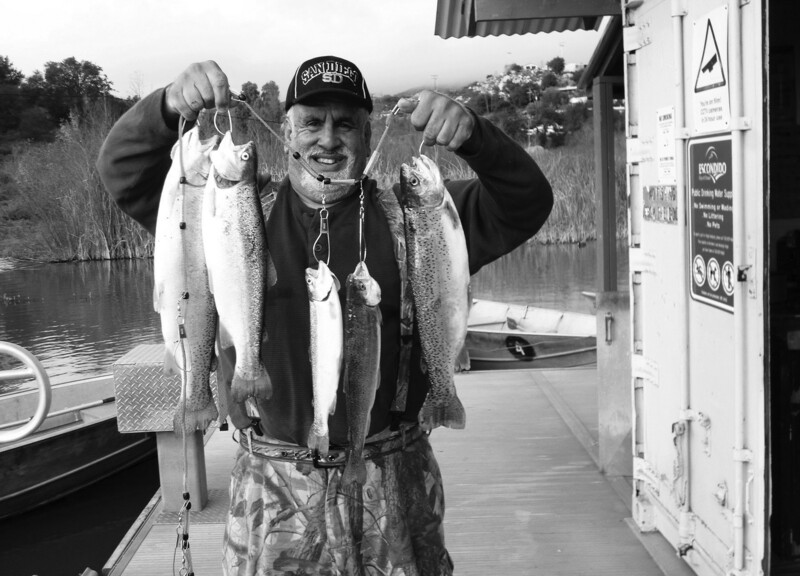 Allen Reyes of Escondido caught his limit on the east end of the lake using powerworms. Mr. Reyes’s stringer of five trout weighed in at 11.90#s. The next trout planting at Lake Wohlford will be 1,500 pounds of the fish on Wednesday, February 22. The most recent trout planting was on February 8. Water temperature: At surface 57.02 f., 9.70 D.O. @ 10’ 54.86 f., 8.37 D.O. To protect Wohlford from invasive exotic Quagga mussels, there is a ban on private water craft and equipment that could have been exposed to mussels. Restricted equipment includes private boats, canoes, kayaks, float tubes, trolling motors, fish finders, anchors, and other equipment that contacts the water. Lake Wohlford is offering $20 all day motor boats to seniors on Tuesday and Thursdays and to active military on the first and third Saturdays of each month. Permits and Boat Rentals are now being issued at the Ranger Station. At present they are limited to cash transactions only. They do not sell fishing licenses, bait, or tackle so anglers must acquire these essentials elsewhere prior to their visit. We apologize for any inconvenience during this transitional period. Largemouth Bass can be found around the structure. Bass respond well to crawdads, swim-baits and dark colored plastics. Each month Whopper Contest winners in four categories are awarded a free fishing and boating permit. For information on the contest or fishing conditions, please contact the Ranger Station at 760-839-4346.